The storeagent and I aren’t getting along too well these days. 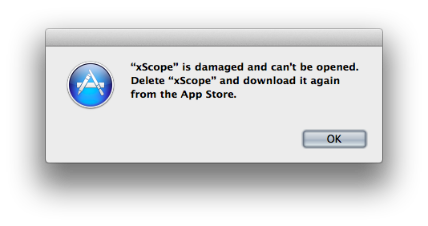 We’re in the process of getting a new release of xScope ready for release. As a developer tool, we’ve been compatible with Mavericks for several months now, but there are some minor bug fixes that we’d like to get out before the new version of OS X ships. As you might be aware, this is the first time I’ve done a build on Mavericks itself. Things haven’t exactly been smooth sailing. Today’s revelation is how storeagent creates the /Contents/_MASReceipt/receipt file in Mavericks. It’s subtly different, and will confuse the heck out of you until you understand what’s going on. This version had a CFBundleShortVersionString of “3.6.2b1”. The installer and receipt checking code was working great. After checking the code signing, bundle IDs and all other parts of the app, I finally fired up the debugger and discovered that the receipt validation code was failing when checking receipt attribute type 3, the Application version field (in Table 1-1). After decrypting and checking the receipt payload, the value was “3.6.2b1” not the version I just installed. Where did this old version number come from? Why did following the advice in the dialog and deleting the app not fix the problem. How come this old receipt kept showing up no matter what I did? Receipts from older versions had never been a problem in previous versions of OS X, so there must be some new behavior in Mavericks. And it took me almost a whole day to figure out that new behavior. It turns out that storeagent is doing some kind of in-memory cache of receipts that have been downloaded from iTunes. Since a network connection is needed to retrieve the receipt, keeping it around would prevent a little bit of network traffic. In previous versions, the receipt was presumably recreated each time it was requested, so you always had a fresh copy. When you relaunch your app, you’ll see the Apple ID login dialog. Since storeagent is launched on demand by launchd, a new process will be started at this point. After entering your Test User credentials, a new, and valid, receipt will be written into the _MASReceipt folder. One could imagine this caching of receipt data being a problem with apps that are downloaded from the App Store. If someone never reboots between two versions of the same app being “Ready for Sale”, it may trigger the same problem. I have no way to test this hypothesis.